Climate change is a specific form of environmental impact that has supranational rather than local or regional dimensions. Human beings all over the world contribute to climate change by emitting greenhouse gases into the atmosphere. The current level of emissions is too high for the forests and oceans to absorb. The resulting warming of the atmosphere has multiple effects, such as the melting of icecaps and changes in the course of the Gulf Stream, which in turn cause floods and rising sea levels, increased droughts and hurricanes. 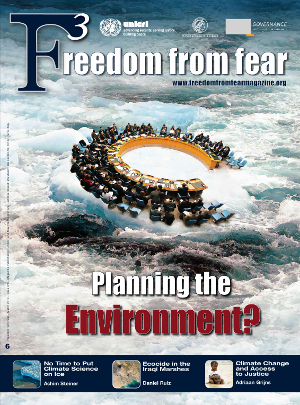 Climate change is a particularly acute concern for the following reasons: the severity and intensity of its impact, which could trigger natural disasters and cause irreversible ecological damage; the anonymous nature of actors responsible for global warming; the uncertainty about its long-term effects and, related to that, its potential role as a trigger and multiplier of forced migration, conflicts over natural resources, political unrest, and increasing state fragility. 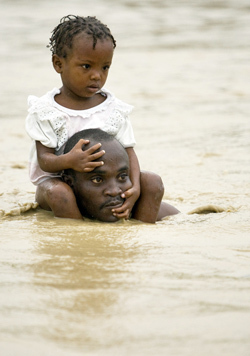 The pain of climate change is accentuated in most of the developing countries. There, the poor and disadvantaged are disproportionately punished: their carbon footprint is limited, yet they often live in areas that are hit harder by the effects of climate change. They are not in a position to easily cope and many risk losing their livelihoods. This is what has been referred to as “climate injustice.” For these reasons, climate change has become a humanitarian and development issue. Mitigation efforts focus on the man-made causes of climate change. They primarily include the adoption and implementation of international agreements and conventions, like the Kyoto and Montreal Protocols on the reduction of greenhouse gas emissions. Various countries have gone on to encourage the development of green technologies and to deter the use and manufacturing of products that help cause global warming. Adaptation efforts on the other hand address the current and expected effects of climate change. They include policies and actions by governments to manage and cope with these effects in their countries. Examples are the designing of disaster plans, or the introduction of meteorological warning systems. Adaptation may also mean investing in long-term water management in places where rising sea levels or flood risks pose a challenge. In the early 1980s an “environmental justice” movement emerged in the US on an access to justice platform. It found that disadvantaged groups in society were disproportionately affected by environmental degradation. Providing them with access to justice it sought to redress the injustices they suffered as a group. Popular environmental justice tools included public interest litigation and class actions. (a) Public Interest Litigation. Public interest litigation allowed specific groups of citizens to act on behalf of a public interest. This was considered to be particularly useful where governments failed to act on their obligations to protect a public interest. Many environmental interest groups successfully sued polluting industries for harm to the environment, or challenged governments on their failing environmental policies. (b) Class Action. Class actions became popular in cases where a specific group of individuals each suffered a specific injury as a result of environmental damage. A good example is the upstream chemical plant that pollutes river water which is sued for damages by people living downstream. The question is whether these tools work similarly well in the climate change context. 5. How can climate justice be obtained? (a) At the mitigation level. There is little success to be expected from litigation to mitigate global warming, for two reasons. (i) There are technical barriers to climate change litigation. It is hard to establish a causal link between the actions of the emitters of greenhouse gases and the damage that the plaintiffs suffer from the resulting climate change. Almost everyone has a carbon footprint. Who could a delta dweller in Bangladesh sue for floods of the Ganges that are indirectly triggered by melting icecaps? (ii) Even if lawsuits were available, these would provide little practical value for the situation found in most developing countries. That is because there are very few major polluters who contribute to global warming in those countries. Likewise, lawsuits targeting governments of developing countries that fail to comply with their mitigation obligations under national or international law would not make a significant impact. With the exception of a few major developing countries, it is mostly the industrialized countries that have heavy burdens to mitigate because of their much larger carbon footprint. Emerging experiences suggest that access to justice on the mitigation level would be better achieved by other means. Advocacy for and on behalf of those who are most vulnerable to climate change in supranational decision-making fora could be an effective way. It would help decision makers put a face to the humanitarian dimension of climate change, making it impossible to ignore the devastating impact that failed mitigation efforts by the industrialized countries can have. (b) At the adaptation level. Arguably, it is at this level that access to justice programmes can provide best results. (i) Access to justice programmes can enable those most vulnerable to climate change to hold their governments accountable if they do not design implement, execute and enforce adequate strategies and policies that protect them from the effects of climate change. (ii) The scope of access to justice would be too narrow if it just focused on access to court procedures. Obtaining justice for those groups most vulnerable to the effects of climate change requires an approach closer to the core: governments and development organizations need to raise early on these groups’ awareness on the effects of climate change, they ought to assess their capacity to adapt and include them in decision making processes. The role of civil society and the media is crucial here. They are able both to communicate and advocate effectively on behalf of these groups when governments’ adaptation policies are inadequate, delayed or inexistent. Ultimately, litigation could be a powerful way to force governments to act, or to challenge their incorrect or late implementation of adaptation measures. (iii) The following is a simple example of how it could work. Poor farmers in sub-Saharan drylands may not be aware of long-term climate trends in their region. An awareness raising campaign informing them that in the near future their traditional crop will not be able to grow anymore can help prepare them for their future situation. Civil society and the media can play an important role in reaching out to the farmers and bringing their voice to the attention of the authorities and public. Part of the awareness process is informing the farmers of the rights that they have. These should then be involved in the decision-making process in determining how to provide for alternative agricultural farming. This would ensure that the solutions chosen meet their needs. Where the government fails to include them within the process and the policies ignore their concerns, the farmers could take the more radical step of challenging the government in court. The aim of creating this multi-layered process is to empower those vulnerable groups in developing countries to make choices on how their lives will be affected by climate change. This is arguably one of the most important ways to achieve “climate justice” for all. * Adriaan Grijns is an attorney licensed in New York, and an independent consultant specializing in sustainable investment and climate change. He is currently working on an assignment for UNDP on access to justice and climate change.